June 15, 2013 2 comments on "Canning Cherry Pie Filling"
Canning cherry pie filling is very satisfying. One afternoon of labor, and you can enjoy cherry pies all winter. With the last few pounds of Rainier cherries I picked this year, I decided to make a couple of quarts of cherry pie filling. We already enjoyed one quart of it in a homemade cherry crisp. Yum! To make and can homemade pie filling, you will need to buy some Clear Jel . Clear Jel is basically the same thing as cornstarch, but it does not clump and separate during the canning process like cornstarch does. The Clear Jel results in a clear, smooth pie filling. The USDA only recommends Clear Jel for canning. Cornstarch is not recommended for canning. You can buy a pound of Clear Jel from Amazon for $10.00. To make this recipe, I followed the basic instructions for canning cherry pie filling available from PickYourOwn.org. That web site has lots of great advice and recipes for beginning canners. I often find myself looking for recipes there. To prepare cherries for canning, you will also need a cherry pitter like the Norpro Deluxe Cherry Pitter . If you don’t have a cherry pitter, you seriously need to get one! They are inexpensive and save a lot of time while preparing cherries for canning. Are you new to canning? The video below will show me prepare this cherry pie filling canning recipe, step by step. Note: 1 recipe = 1 quart cherry pie filling. 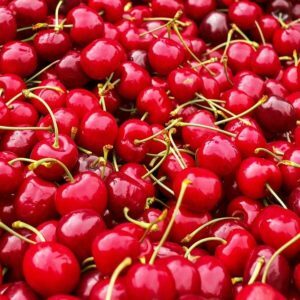 You can make cherry pie filling from either sweet cherries or sour cherries, depending on preference. This recipe makes 1 quart of cherry pie filling. To make more jars, just multiply the ingredients by however many jars you want to make. Only make as many jars as your canner can hold at one time. Before you start, sterilize your canning jars, lids and rings. Put your boiling water canner on the stove so that the water can start heating up while you prepare the cherry pie filling. Mix Clear Jel, sugar, water, cinnamon, almond extract, and food coloring together in a large sauce pan or pot. Heat and stir over medium high heat until the mixture begins to boil. Stir in the lemon juice, and boil for 1 minute. Mixture will get thick. Stir the cherries into the hot pie filling. Fill hot sterilized jars, leaving 1 inch head space. It is okay to add a little water to the jars if you find the mixture is too thick. Wipe the mouths of the jars with a clean damp towel, and put the lids and rings on the jars. Process the jars in a boiling water canner for 30 minutes. Remove the jars from the canner and let them set on a towel on the kitchen counter until the jars are cool and all lids have sealed. These jars can be stored in your pantry for a year or more. One quart jar makes one cherry pie. 2 Comments on "Canning Cherry Pie Filling"